Gmail Alerts is a free Windows 8 app that periodically fetches emails from your Gmail or Google Apps account to keep you updated and organized. This Windows 8 Gmail alerts app is more like a reminder service that informs you about arrival of new emails in your Inbox. It reads the lists of unread messages using Gmail RSS API and presents those to you inside the app. On launching this Gmail Alerts App for Windows 8 for the first time, you will be prompted about allowing it to run in background. It is recommended that you click on ‘Allow’ button. If you are too keen about limiting battery consumption on your Windows 8 machine then click on ‘Don’t Allow’ button. Soon, you will be presented a panel to the right side with a login window. Your task will be to specify the refresh interval in minutes using the dropdown list at top. Then you will need to provide your Gmail credentials and click on ‘Login’ window. 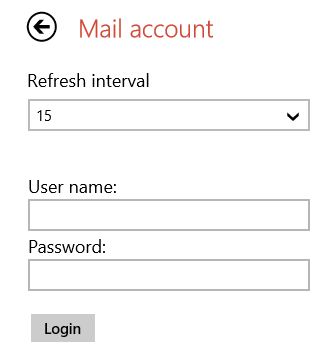 After successful login, the window will refresh and the list of your latest emails will be presented to you. The tiled buttons include the subject of message and email of the sender for easy identification. To read email you will require clicking on particular button and it will load in your default web browser. Well! it was disappointing, but considering it as a Windows 8 Gmail Alerts App the issue looses it significance. If you want to view the latest unread emails then right-click on blank section of interface to display the horizontal bottom bar with ’Reload’ button placed in the rightmost corner. Again the interface will reload and you will be presented the updated list. Also, check out our posts on Search Engine Apps, Chat Apps, and Pinterest. To install Windows 8 Gmail Alerts App, you will require opening this link in some supported web browser like Internet Explorer 10 or later. Then you need to click on ‘View in Windows Store’ button placed on the left panel of webpage. After being redirected to the Windows Store; click on ‘Install’ button. * The application requires permission to access your email address. 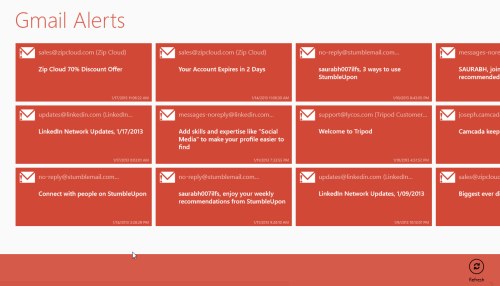 Windows 8 Gmail Alerts App is nice. You can use it as per your specific requirement.